"Where the Rustic Mountain Atmosphere Awaits You"
The cozy atmosphere and rustic mountain décor at Grandview Lodge in Waynesville, North Carolina, make it a great place to wind down after a day of exploring the Great Smoky Mountains and surrounding area. It’s a familiar, comfortable place to relax, to enjoy nature, and to engage with one another in the majestic mountains setting of Western North Carolina. Located in the Blue Ridge and Great Smoky Mountains of western North Carolina, Grandview Lodge puts you in the heart of one of the nation’s most beautiful areas. Known for its natural splendor, activity-filled outdoor lifestyle and serenity, this magnificent setting offers a variety of activities or the perfect backdrop to do nothing at all. And you'll find plenty of area attractions. 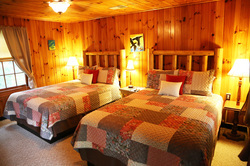 Each of Grandview Lodge's rooms has its own personality and design. Comfortable and quaint, each room includes a complimentary Farm to Table breakfast, and free wi-fi. There's plenty of peace and quiet for the ideal couple's retreat or romantic getaway. And some of our rooms are designated pet-friendly too! Check availability to help plan your next mountain vacation. 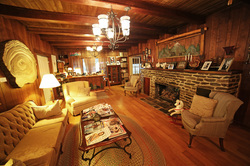 Learn more about our mountain lodge in these photos. Looking for a rustic mountain setting for your wedding or special event? We can accommodate up to 32 lodging guests in our guest rooms and cottage; and dining is available for up to 100 event guests. Authentic mountain surroundings and beautiful landscaping grounds ensure a memory-making experience. It all comes together to make this special place a home away from home that you’ll enjoy returning to, year after year. Looking for a gift of lodging? Give someone special a Grandview Lodge getaway. Learn more about gift certificates.